Summer 2017 - Learning in Grandpa's shop. The youngest generation of fine wand makers has arrived! At just 12 years of age, Ian turned his Harry Potter obsession into a hobby business to fund his future college ambitions. 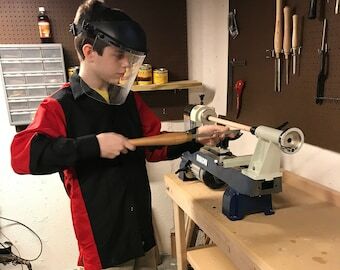 Ian's grandfather is a master wood worker and after several weeks of turning with Grandpa, Ian got his very own lathe. Check him out on Facebook @WizkidWands for videos, pictures, updates and information on local appearances! Loves all things Harry Potter and University of Michigan. Jack of all trades and fellow wand master.